Synopsis: Humans and androids crowd the raucous streets of New Beijing. A deadly plague ravages the population. From space, a ruthless lunar people watch, waiting to make their move. No one knows that Earth’s fate hinges on one girl. . . .Cinder, a gifted mechanic, is a cyborg. She’s a second-class citizen with a mysterious past, reviled by her stepmother and blamed for her stepsister’s illness. But when her life becomes intertwined with the handsome Prince Kai’s, she suddenly finds herself at the center of an intergalactic struggle, and a forbidden attraction. Caught between duty and freedom, loyalty and betrayal, she must uncover secrets about her past in order to protect her world’s future. 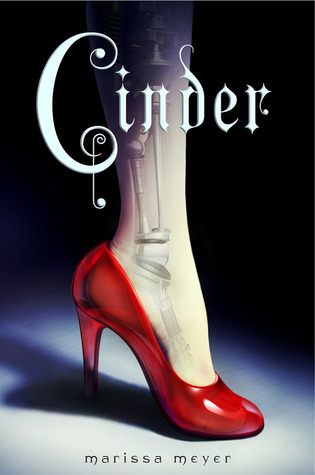 Review: 4 Stars - Cinder by Marissa Meyer is the first installment in the Lunar Chronicles. It begins the retelling story of Cinder, mechanic and cyborg with a wicked stepmother and all. Set in New Beijing, in a city affected by a horrible plague Cinder lives with her stepmother and stepsisters. Being forced to work in a market stall to help support her family she’s become known for her knowledge of all things mechanical. It’s through this she runs into trouble from all sides. I seriously loved Cinder – the story and the character. It’s a huge mystery surrounding not only Cinder but the lunar people and the fate of the world. Meyer executed the mysterious sides of the story extremely well, thanks to the wonderful writing. The tensions between the Luna people and the rest of the world is at an all time high and it’s up to the prince – Kai – to try to find a way make a peaceful way of life for the whole planet and the people from the moon. The people from the moon are more than they seem, with abilities that make them even more menacing and trouble for all the people on earth. Mix in an evil Luna queen and it’s just bad, bad, bad. Kai and Cinder each have a lot to deal with and as the story grows their troubles mount. I haven’t had a chance to read many retellings, but thought that this was does amazingly well. It followed along with the original story yet Meyer had taken it and added her own layers and textures. It’s one of those books that the more pages you read, the more you finding yourself involved in the characters lives and just how Meyer will mold the story next. All in all, Cinder was thoroughly enjoyed by this reader and I can’t say enough how much I am looking forward to the next book in the series. There’s so much to find in the book with the red shoe on the cover that this review can’t contain, that I’ll just say that Meyer has a huge imagination and doesn’t hold anything back in Cinder. If you haven’t read Cinder yet and are looking for a book that’ll wow you, that’s vastly different from other YA titles out there, then this is defiantly the book for you. I think Cinder is very good and Meyer is an excellent writer. Did you know she is better known for her Sailor Moon fan fiction ? I think this goes to show that fan fiction can be a startig point for writers. Glad you enjoyed this! I thought it was amazing too... this is definitely one of the better retellings you'll find in a long time. I liked Cinder a lot too (although it's not my favorite Cinderella retelling; that would be Phoenix and Ashes by Mercedes Lackey). Can't wait for the sequel!